Enos Bradsher Slaughter (April 27, 1916 – August 12, 2002), nicknamed "Country", was an American Major League Baseball (MLB) right fielder. 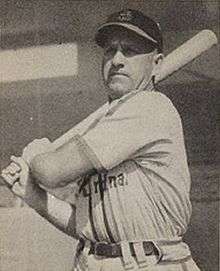 He played for 19-seasons on four major league teams from 1938–1942 and 1946–1959. He is noted primarily for his playing for the St. Louis Cardinals and is best known for scoring the winning run in Game Seven of the 1946 World Series. A ten time All-Star, he has been elected to both the National Baseball Hall of Fame and the St. Louis Cardinals Hall of Fame. Slaughter was born in Roxboro, North Carolina, where he earned the nickname "Country", and joined the St. Louis Cardinals in 1938 before being traded to the New York Yankees in 1954. When Slaughter was a minor leaguer in Columbus, Georgia, he went running towards the dugout from his position in the outfield, slowed down near the infield, and began walking the rest of the way. Manager Eddie Dyer told him, "Son, if you're tired, we'll try to get you some help". During the remainder of his major-league career, Slaughter ran everywhere he went on a baseball field. In 1937, he had 245 hits and 147 runs scored for Columbus. Slaughter batted left-handed and threw right-handed. He was renowned for his smooth swing that made him a reliable "contact" hitter. Slaughter had 2,383 hits in his major-league career, including 169 home runs, and 1,304 RBIs in 2,380 games. 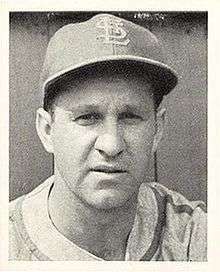 Slaughter played 19 seasons with the Cardinals, Yankees, Kansas City Athletics, and Milwaukee Braves. During that period, he was a 10-time All-Star and played in five World Series. His 1,820 games played ranks fourth in Cardinals' history behind Ozzie Smith, Lou Brock, and Stan Musial. He presently ranks second in RBIs with 1,148; fifth in ABs with 6,775; and sixth in doubles with 366. Immediately upon return from his military service in 1946, he led the National League with 130 RBI and led the Cardinals to a World Series win over the Boston Red Sox. In the decisive seventh game of that series, Slaughter, running with the pitch, made a famous "Mad Dash" for home from first base on Harry Walker's hit in the eighth inning, scoring the winning run after a delayed relay throw by the Red Sox' Johnny Pesky. The hit was ruled a double, though most observers felt it should have been ruled a single, as only the throw home allowed Walker to advance to second base. This play was named #10 on the Sporting News list of Baseball's 25 Greatest Moments in 1999. Slaughter was known for his hustle, especially for running hard to first base on walks, a habit later imitated by Pete Rose and David Eckstein. Slaughter was allegedly one of the leaders of racial taunting against the first black major league player, Jackie Robinson, and he had injured Robinson during a game by inflicting a seven-inch gash from his shoe spikes on Robinson's leg. Slaughter had denied that he had any animosity towards Robinson, claiming that such allegations had been made against him because he was "a Southern boy", and that the injury suffered by Robinson had been typical of Slaughter's rough playing style. Slaughter retired from major league baseball in 1959. He was a player-manager in 1960 for a minor league team in Houston and for Raleigh in 1961. Slaughter coached baseball for Duke University from 1971 to 1977. Enos Slaughter is a cousin of Henry Slaughter, southern gospel musician. Slaughter died at age 86, on August 12, 2002, after battling non-Hodgkin's lymphoma. He was scheduled for an autograph appearance in St. Louis, Missouri before he died. Enos Slaughter's number 9 was retired by the St. Louis Cardinals in 1996. Slaughter was elected to the Baseball Hall of Fame in 1985. His jersey number 9 was retired by the Cardinals on September 6, 1996. The Cardinals dedicated a statue depicting his famous Mad Dash in 1999. Slaughter was a fixture at statue dedications at Busch Stadium II for other Cardinal Hall of Famers during the last years of his life. In January, 2014, the Cardinals announced Slaughter among 22 former players and personnel to be inducted into the St. Louis Cardinals Hall of Fame Museum for the inaugural class of 2014. ↑ Cardinals' Media Relations, ed. (2001). St. Louis Cardinals 2001 Media Guide. Hadler Printing Company. pp. D–20. ↑ "Baseball's 25 Greatest Moments". Baseball Reference. Retrieved 9 Oct 2016. ↑ Autograph Collector Magazine. 2002. p. 126.